Rooted in passion, integrity and innovation, we’re passionate about the products we offer. Established in 1978, Island Companies Ltd has grown to become one of the largest duty free retailers in the Cayman Islands. 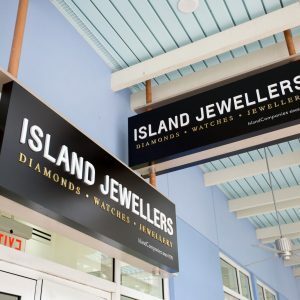 With 12 stores in Grand Cayman selling a wide variety of merchandise from beautiful diamonds, designer jewellery and timepieces. Our 12 stores include the only Pandora store and Swarovski boutique on the island and 6 Island Jewellers locations. For more than 40 years Island Companies Ltd have played an integral part in incredible customer stories. We understand that jewellery, timepieces, fashion accessories and even cigars are a treat and a luxury and so we aspire to ensure that we never take our role in these important memories for granted. Therefore with renewed focus our mission is not complicated. In every detail of our day we must do everything in our power to create great memories. Established in 1978, Island Companies has grown to become one of the largest duty free retailers in the Cayman Islands. With 12 stores in Grand Cayman selling a wide variety of merchandise. Dart Enterprises Ltd enter a partnership with Island Companies Ltd.
Got any questions? We'd love to answer them!